Growing it was great pleasure,very strong plant,i grew her without any problems. 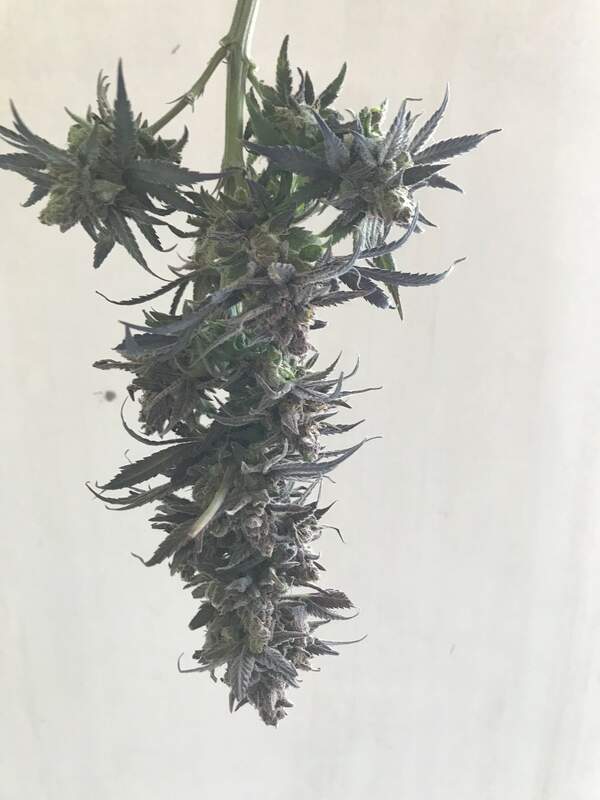 Harvested her on bloom day 76 after 72 hours of darkness.She had 10 stems.5 for jarcure and 5 for watercure. Bud wet and with stems,weight was 972 grams. 615 grams with stems went in dry room. 357 with stems was 289 grams when removed stems without stems went in watercure. 615 grams when was dryed came out 117 grams and went in jars for curing. its day 7 for watercured 289 grams i dont know yet what will be on scales when dryed it my first watercure. On dry weight i wrote 180gr dry I will update when it will be ready its still 90 ppm in water. Hight is very calming and without euphoria clear headed and a bit energetic,perfect thanks to RoyalQueen. Hi,its week 7 in flowering and I can see many amber trichromes already but the seedbank says 9 weeks. Isnot it to early for amber trichromes?On the top layer of buds there are 20% amber and on down part about 10%. Isnot it too early? I have had that in one of my cbd plants too. How does the other trichs look like, clear, milky? In my case i just continue flowering for like 3 weeks more and the amber did only increase 5-10% more and i got a great medicine. So i wouldn't worry. Good luck in the final weeks. Hi mate, I swear by this; Room Temperature - Around 70°F (21°C) 50% Humidity Depending on the Humidity in your area drying should take between 3-7 Days. Some people prefer to dry longer, 10-14 Days. The slower the better. Optimal Environment in Jars (Curing): Room Temperature - Around 70°F (21°C) 58-65% Humidity Best smelling buds after that ;) Hope this helps and feel free to message me if you're stuck. Hi there! Well, watercuring does not involve any special drying process. 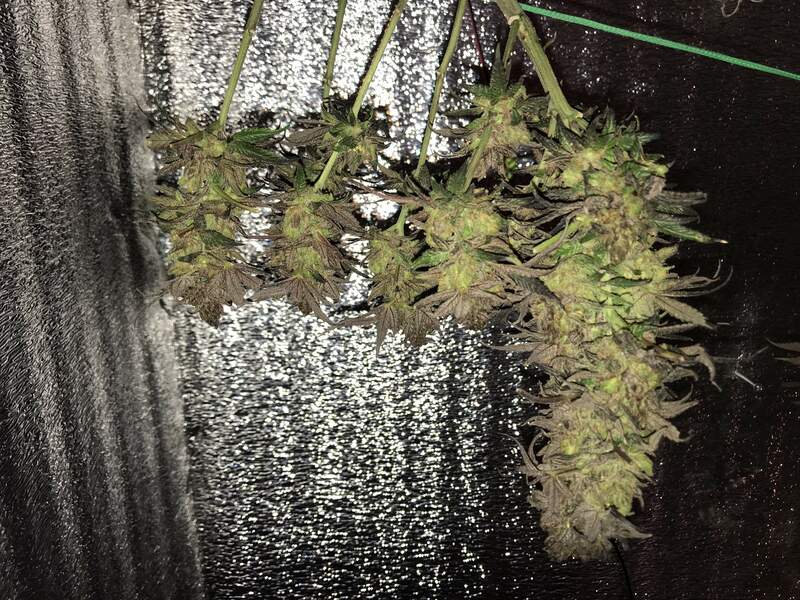 You'll need an average RH (40% - 50%) and an average temperature (20° - 22°) so your buds can dry slowly but surely. A continuous airflow (in/out) is also highly recommended. After a few days, you'll try to bend/writhe some stems, if they're snapping/breaking, you're good to go, you can move your buds to their final container (glass jar, vacuum pack...). If the stems still bend, this means your buds still contain moisture so you should wait a few more days. Good luck, enjoy your harvest! Fantastic grow and yield! Congrats! @Horantu,Thank you for kind words bro! @Somnabull Hi there! Well, watercuring does not involve any special drying process. You'll need an average RH (40% - 50%) and an average temperature (20° - 22°) so your buds can dry slowly but surely. A continuous airflow (in/out) is also highly recommended. After a few days, you'll try to bend/writhe some stems, if they're snapping/breaking, you're good to go, you can move your buds to their final container (glass jar, vacuum pack...). If the stems still bend, this means your buds still contain moisture so you should wait a few more days. Good luck, enjoy your harvest!